Lacquering is a process used to create a special protective and decorative coating on wood or other materials. Lacquering in Japan is a very traditional art form, having been used for thousands of years. Japanese lacquer, called "Urushi" ( ), is a natural material taken from Japanese lacquer trees. Distinct properties of Urushi lacquer create a higher quality product, with greater strength and aesthetics, compared to alternative lacquering materials. A Pilot Custom 845 is crafted from special Japanese ebonite and lacquered using only pure Urushi lacquer, free of manufactured oils that might harm the final product. Pilot uses a lacquering technique called Roiro to create the distinctive coating found on the Custom 845. Roiro lacquering requires substantial time and skill to create a uniform and mirror-like finish. All Custom 845s are lacquered, cured, and polished three times to create an unrivaled quality product. Because of the tremendous skill required to achieve a Roiro finish, Pilot employs skilled craftsman to create the Custom 845, refusing to outsource production. The combination of raw materials and fine craftsmanship create a quality writing instrument and a work of art. 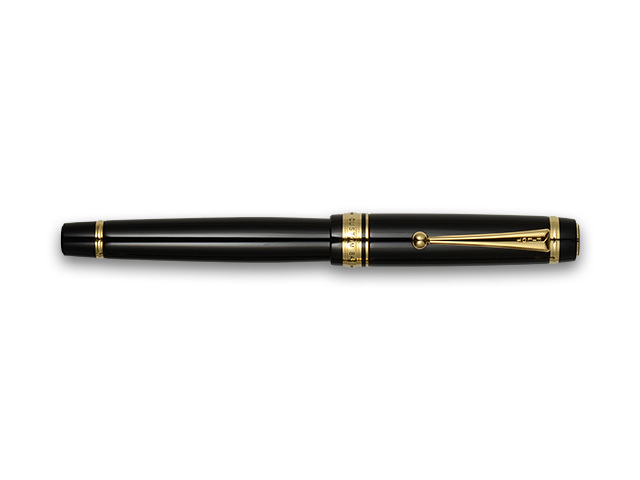 Traditionally, the Pilot Custom 845 has only been available in black. After a lengthy negotiation, we have partnered with Pilot to offer a second color: Vermillion red. Vermillion is a symbolic color in traditional Japanese culture, representing nobility and high status. Vermillion lacquerware and religious shrines are emblematic of the finest in Japanese craftsmanship. Knowing the tradition and quality of the Custom 845, I approached Pilot about creating a special edition of the pen in vermillion. A vermillion Custom 845, offered exclusively from Tokyo Pen Shop Quill, combine the exquisite quality of Pilot craftsmanship with the traditions of nobility and high-status. Creating a vermillion Custom 845 is not easy. The process of repeated lacquering, curing, and polishing takes almost six months and requires specially trained craftsman. This limits the number of pens that can be produced but ensures that each pen is worthy of admiration. In addition to a vermillion Custom 845, Tokyo Pen Shop Quill offers a wider variety of nibs for the Custom 845 than can be found from other suppliers. The Custom 845 comes standard with an 18K gold and rhodium bicolor. While this nib is ‘standard’ it is anything but ordinary; providing a superior writing experience, with smooth and consistent ink flow. The FA nib, sometimes referred to as ‘Folcan’ in Japan, is a soft nib, allowing more expressive penmanship and variable line widths. This nib is ideal for calligraphers or for those who prefer a flexible nib to create very distinct writing. The WA nib is a size M Waverley nib. The tip of a Waverley nib is slightly curved, allowing greater contact between pen and paper. This contact creates a smooth writing experience, regardless of the angle you hold the pen or whether you write left or right handed. This nib is ideal for those who wish to use their Custom 845 on a regular basis for a wide variety of tasks. I use this nib every day and highly recommend it. The moisture and oils naturally produced by your hands will further enhance the Urushi lacquer found on your Custom 845. Overtime, as you use your Custom 845, the pen will become a truly unique and personalized product. Frequent use of the Custom 845 will only enhance an already superior product. The only way to truly appreciate a Urushi lacquered Custom 845 is to hold one in your hands. Once experiencing a Custom 845 you will wonder why you ever used another pen. While we encourage you to frequently use your Custom 845 we suggest that you protect the pen from prolonged exposure to sunlight. The natural materials used to create the lacquered finish may slightly discolor if not properly protected from excessive sunlight. For long period out of stock status of Pilot Custom 845 FA nib, WA nib and all vermilion lacquer models, we sincerely apologize to customers who are willing to purchase these products. The batch we ordered in May, 2016 was estimated to deliver to our shop before July, 2017; whereas in February, 2017, we are noticed by Pilot that the delivery will be delayed to 2018 and still have no specific date. 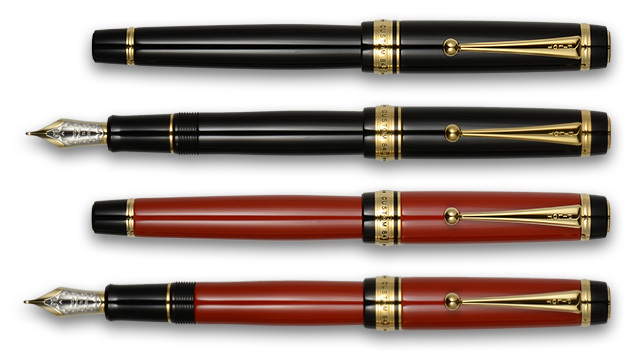 For Pilot Custom 845 FA nib, WA nib and all vermilion lacquer models, these are our shop’s original models and each of them need 6 months as delivery period. In September, 2016, Pilot noticed us they have to prolong delivery period to 8 months because they have to spare production capacity to produce the new “Custom Urushi” model which is available form 2016’s autumn. Custom Urushi shares same material and production process with Custom 845. Since Pilot wants to keep Custom Urushi’s delivery away from any delay issues, they have to prolong delivery period of Custom 845 vermilion lacquer models to 8 months. We accept 8 months as delivery period for two reasons: one is that we couldn’t interrupt Pilot’s normal production since they spare capacity to make vermilion lacquer models only for us, another one is that we haven't announce the scheduled delivery time for next batch in that time. Besides the prolonged delivery time, Pilot also noticed us they have to raise the item price because the cost of ebonite and lacquer is raising. Based on Pilot’s notice above, we projected the delivery would be on early 2017 and ordered in May, 2016 and we planned to update specific delivery date and price once we have further information from Pilot. In early 2017, Pilot told us the capacity is still insufficient to meet their delivery schedule of Custom Urushi and they have to delay the delivery of our order to 2018 and still have no specific date. For the raised price, they answered the new price will be 60,000 JPY excluding tax. Here we have additional information about Custom Urushi. Pilot will issue vermilion lacquer models of Custom Urushi when production capacity could meet the schedule of black lacquer models on time. Pilot also told us that it’s highly probably our vermilion lacquer Custom 845 order would arrive after they issues vermilion Custom Urushi. According to Pilot’s plan, vermilion Custom Urushi would be regular lineup when our vermilion Custom 845 arrives. For customers who are planning to purchase vermilion lacquer model, vermilion Custom Urushi would be another size option we can offer. Above is detail background and thank you for your patience of long text reading. We also explained the background to customers who had mailed the inquiry. As our constant policy, we refer customers who have ordered and still waiting product’s arrival as our first priority when issue effects them occurs. And we will use our policy to negotiate with manufacturer again and again when condition changes. Still, we are sorry to announce that this time we are no able to avoid out of stock status for long period. We will continue to negotiate with manufacturer for shorten delivery period. Custom 845 FA nib model does not exist in ready-made products at Pilot. This model is the special order product by request from our shop to Pilot. The writing taste of FA nib in a Custom 823 is highly recommended because it brings good balance of nib softness and the weight. FA nib has been specially designed to pursue high-quality flexibility. It is not only simply as soft. FA nib has supple react from the tip, you can express steplessly until a very thick line from fine line. Its touch is similar to "Fude". "Fude" is a Japanese brush, it is using in "Shodo"(Japanese calligraphy). You can enjoy the beautiful handwriting taking advantage of the expressive power by its delicate tip and toughness root. So, we call this nib "Fude touch". In addition, lines of FA is similar to the lines of nib for copperplate-script which using in calligraphy, so it is also popular fountain pen from many calligraphers. Points to note, it is not suitable for the writing-style which takes angle standing or strong pressure. It is suitable to using with some extent low angle and rhythmically pressure. Nib Model name is "FA", but also has the nickname "Folcan" in Japan. Reservation for the restock item in 2018 is full, we cannot accept reservation now, sorry. When ordering, please copy the product name and paste to the Order Sheet. Custom 845 WA nib model does not exist in ready-made products at Pilot. This model is the special order product by request from our shop to Pilot. This nib is really recommended from me. I also regularly use Waverley nib every day. The pen point is nearly M size. And it has characteristic that the tip of nib is a little bended. This curve producing writing taste very smooth with no stress. Smooth every direction of the pen strokes, it's so wonderful writing taste. The notable point is that it is very smooth even when write in the direction pushing. At first glance, bended nib is looks like that the thickness of the lines can be varied according to the angle of the pen, but it is not. In fact, it is designed to keep the same contact area anywhere on the curve of the bent when contacting to the paper. It means that the writing lines being the same thickness at most cases of nib angles. Thus, it has the very high ability to respond to individual differences of the angle and twist at writing. Taking advantage of these features, of course you can enjoy ease of usual writing, and further can write very smoothly even when using various strokes such as flowchart shapes. In addition, Waverley nib is also ideal for Arabic or left-handed writing. Because there are a lot of pen stroke of opposite direction in these situations. We are sorry out of stock now, will be restocked in 2018 and restock date undecided. In spite of fine nib, the scratch feeling is very few and smooth writing feeling. The reason for this, is the shape of the pen point. Pen point of Pilot has a beautiful roundness, even if it's small size. In addition, its goodness of the flow is also an important factor. In the M of the fountain pen in the world, it could be regarded as M rather thin somewhat. I think it is not too thick, and has a wide versatility. The good ink flow and the beautiful rounded pen point brings smooth writing. Then, you can enjoy a beautiful "light and shade" of ink by good ink flow. Pen point of B of the pilot has a beautiful roundness. A pen point in general of B often have a square-built shape. If the pen point is a square-built shape when thick like B, writing angle and the degree of twist will be restricted by its corner. It is because the corner of the pen point hinders that contacting the slit to the paper. Under such circumstances, in order to touch surely the slit to the paper, it will need a writing pressure at all times. However, at the pen point of Pilot, the writing is smoothly even at light pen pressure. It is because rounded pen point can be touch the slit to the paper in a wide range of angles. This means that it brings a comfortable-writing without nib tuning, by having excellent ability to respond to individual differences of angle of writing. In addition, the line is thick in the same for any direction by this roundness, so you can enjoy a quality of imposing bold. The pen point of BB is a big spherical with a rich volume. Writing by a wide contact surface that is formed on the big sphere, so it is possible to write thick in any direction. Tips to enjoy a sufficient thickness is to write not twist too much. This nib brings the fun of the "light and shade" and daring thickness, by its good ink flow and rich pen point.